who will protect you and yours families. The Tibetan Mastiff also known as the "Do-Khyi". They is a ancient breed, have been in existence as early as 1100 BC. They is descended from crossing the famous Tibetan dogs and Mastiff. They were bred to guard the property, herding dog and guardian dog. 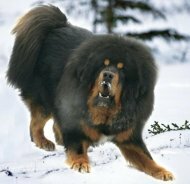 The Tibetan Mastiff is the hardest dog breeds to train. They learn the news commands more slowly than other breeds. The early socialization training is important, as this breed is very protective. Should let's this dogs meet variety of people and other dogs.